There was a flurry of Tweet-traffic last week around the launch of Housing Minister Grant Shapps’ new self-build initiative. Regular readers may recall I wrote about this a couple of times last year – including this post where I suggested the easiest way to increase significantly the flow of land into the self-build sector would be to make house-builders included a quota of serviced plots on each large site they develop. The new initiative has been developed in close discussion with the National Self Build Association and was launched by Grant Shapps and a bevy of celebs (Tommy Walsh, et al) at a Downing Street ‘do’ last week. It is supported by a new ‘Self-Build Portal’ which gives a useful new starting-point for potential self-builders, and a push to increase the availability of self-build mortgages. The press release also claims a reduction in red-tape for the sector through the new National Planning Policy Framework (NPPF) – which I can’t really see, myself. But what of the really big issue…land? …including affordable housing and the needs of different groups in the community (such as, but not limited to, families with children, older people, people with disabilities, service families and people wishing to build their own homes)’. The NPPF’s critics say its brevity (50 pages replacing more than 1,500 pages of the old Planning Policy Guidance Notes and Statements) is a double-edged sword, which will lead to chaos and confusion as different stakeholders and their lawyers argue over what such pithy statements will actually mean in real life. But taken at face value this paragraph would certainly seem to require Local Authorities to assess the demand for self-build in their area and then cater for that need. Applying a quota to large new-build sites, as I suggested in my earlier post, would certainly seem a straightforward way to approach this; we already do it for affordable housing. Relatively prosperous and attractive Norfolk is an area of high demand and therefore low availability for self-build land – as the new Self-Build Portal will confirm. So what sort of provision might the region’s Local Authorities eventually have to make for self-build land? 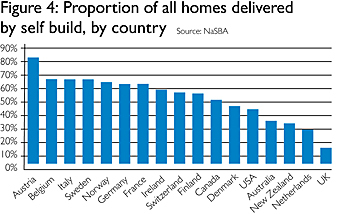 Well, the government’s figures indicate that self-build homes already account for around 10% of new homes in the UK each year, and that as many as 1 in 2 people would consider building their own home if they could* – which would be consistent with the level of self build in most other developed countries. Wymondham, the market town where I live and work, is ear-marked to take 2,200 new homes in the emerging Local Development Framework. If South Norfolk set a quota of only 10% for self-build sites, alongside its 20-33% target for affordable homes, that would mean the delivery of 220 self-build plots in Wymondham over the plan period – and a whopping 1,600 in South Norfolk as a whole. That would be a big deal, not only for those who would like to build their own home…but also for local architects, like us at Lucas Hickman Smith, for whom the self-build sector is already a mainstay of their workload. *A 2011 YouGov poll commissioned by the Building Societies Association, quoted in ‘Laying the Foundations: A Housing Strategy for England’. This entry was posted in Development/Land-Use and tagged Building Design, Grant Shapps, housing delivery, NPPF, policy, self build. Bookmark the permalink.